The summer of 2014 continues to be dominated by headlines about women climbers pushing the limits of what has been done before, and last week that trend continued with hard sends by Angie Payne and Alex Puccio in Colorado’s Rocky Mountain National Park. For Angie Payne it was the vanquishing of her long-term project Freaks of the Industry (V13). After four seasons of work she was able to piece together this long, crimpy James Litz problem for its First Female Ascent. 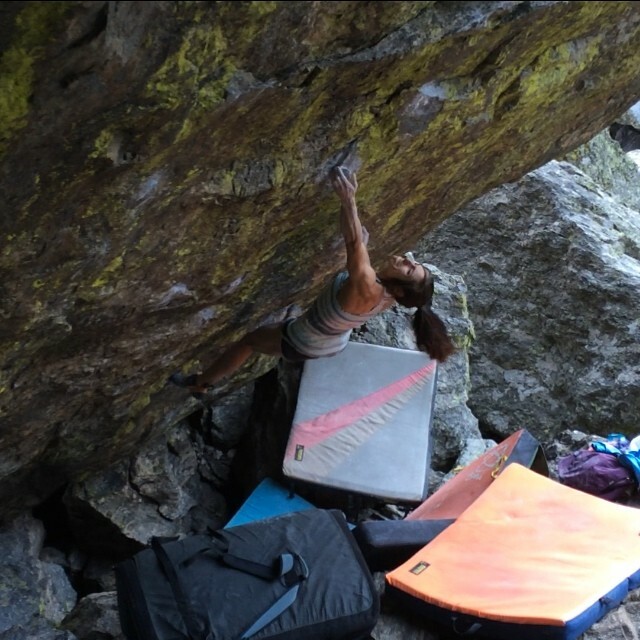 It was just a short month ago that Alex Puccio “finally” did her first V13, and I would have to say not all that surprisingly she has now done her first V14 with an ascent of Daniel Woods’ testpiece Jade, which is also in Upper Chaos Canyon in RMNP. Puccio nearly pulled it off on her first day trying the problem, falling after the crux, but in the end it would take her four days of work to become the first woman to climb a V14 on American soil. Wow, that is so awesome! I hope someone got good footage. How many people have done Jade? I guess all that world cup training is good for something. It doesn’t seem like it took Puccio that long, especially considering how long it takes me to climb v5s. It would be pretty cool if she could do some v15s. Isn’t there footage of Ashima looking strong on it.